If you want your garage to last over through the years, get in touch with All Garage Door Repair Irvine. We provide garage door repairs that boast quality and precision. When you choose us, you can bet that you are choosing the best garage door repair service in Irvine. In addition to making sure that every part of your garage door system is working at its best, we also offer maintenance services that you can avail of. This way, your garage door will continue to function smoothly over the years and give you better returns on your investment. Why is All Garage Door Repair Irvine Essential? At All Garage Door Repair, we are dedicated to providing customers with garage door repairs that are par excellence. Known for our quality and prompt response to all garage door needs, we have been able to obtain a loyal customer base. If you come to us when your garage door is malfunctioning, we will handle the situation immediately and get your door back to working condition in no time. Many times, people choose to try and resolve small repair work themselves. However, this can be dangerous if you don’t know what you are doing. Our repair crew here in Irvine is talented and knows their way around all kind of repair work as well as garage door installations. So when you come to us, you can bet that they will be able to address all your problems for you. Most of the time it is the spring or panel that need to be repaired or replaced. 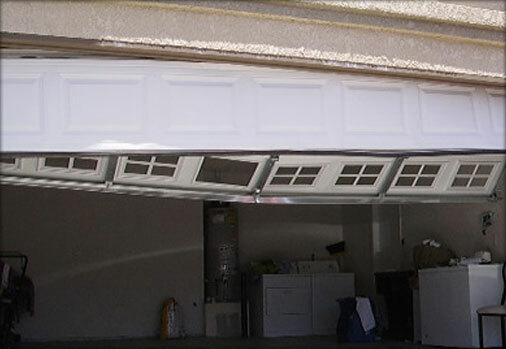 We provide you with garage door dented panel replacement, garage door spring repair, garage door track repair and more. While all garage door repair companies can provide you with these services, what makes us different is the fact that we are prompt, thorough and efficient that will not let you down anytime soon. This is why you should avail of our garage door repair services here in Irvine. At All Garage Door Repair Irvine, we make sure that our crew does a thorough repair job, leaving no scope for any damage along the way. Having the ability to tackle all kinds of garage door repair needs, our crew makes it a point ensure everything is right before they are done with the job. We design our services to ensure that you and your family are kept safe. However, to make sure your safety is well taken care of, you should avail of our maintenance checks. Our maintenance services are meant to ensure that every single component of your garage door is in good condition. If any part is broken or damaged, we will have it removed and replaced. What’s more, our technicians will make sure that all the 300 parts that make up your garage door system are looked at and are functioning appropriately. Torsion springs and extension springs are the main components that hold your garage door together. However, if they are not installed properly, they can be a potential hazard to you and those around. This is why it is always best to get the experts to install your garage door for you. By putting All Garage Door Repair Irvine on the job, you can be sure that there won’t be any possibility of the springs suddenly snapping and the whole door collapsing. Our parts are of the highest quality so you can be sure that they will not let you down. Since we are committed to ensuring that our mechanism doesn’t hamper your safety in any way, our trained crew will always ensure that the safety cables are installed in the right manner. Although the installation process can be time-consuming, if not done properly it can be very dangerous. This is why you should always call in the experts to handle the job for you. If you need emergency garage door repair services, we are the people for you. Give us a call and we will be there within the hour to attend to your every need. We offer same day service and available round the clock. Our crew is trained to address every garage door repair and installation need that you throw our way so expect only the best service from us. Dedicated to providing customer satisfaction, you can be sure that we will not leave until you are satisfied with the job. So if you are looking for a reliable company that will attend to your garage door repair needs, All Garage Door Repair Irvine is the place for you.